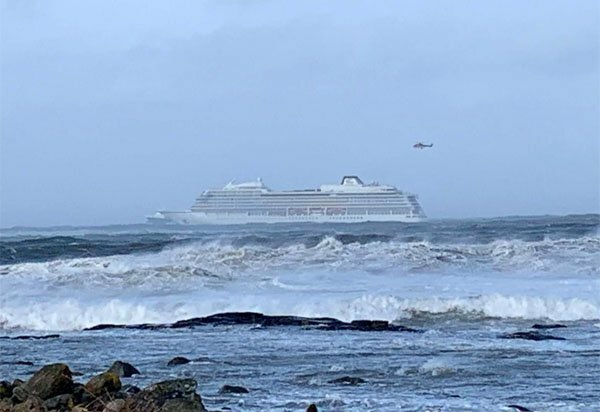 The Viking Sky, with around 1,300 on board, sent out a mayday late in the afternoon after suffering engine trouble in one of the most dangerous strips on coastline, known as the Hustadvika bay. Made up of treacherous reefs, the bay has claimed the lives of hundreds over the years, and as the gales and waves rose, at least two more rescue ships had to turn back within sight of the stricken Viking Sky. 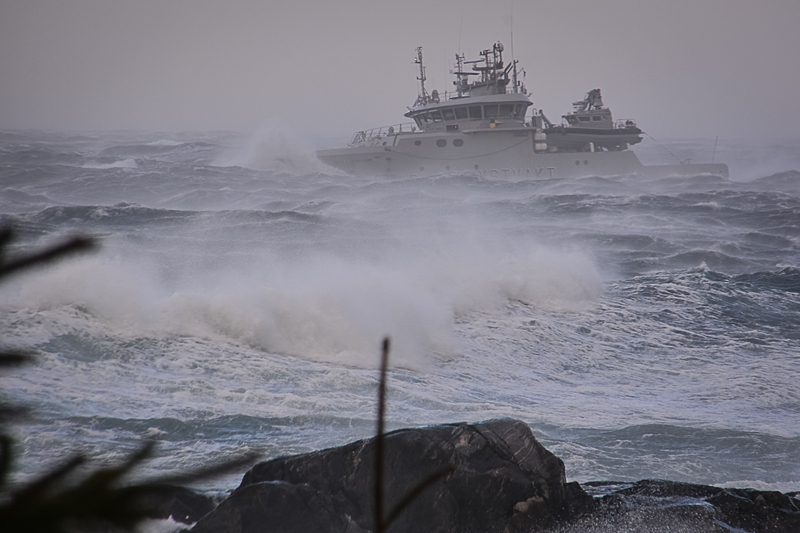 At least one rescue boat, the Hagland Captain, went down in the fierce weather, with the nine people board having to be rescued themselves, as Norway faced some of the worst storms seen off its coastline. Windows on board the ship were smashed by the waves, and there were early reports of at least eight people injured. As the storm continued to batter the vessel, rescuers said they expected the evacuation to go on all night. A Scot who saw the cruise ship from her home on the coast of Norway said the wind was so strong yesterday she struggled to stay on her feet. Gillian Varley, who lives in Øksenvågen, saw the ship sail past her home minutes before it ran into trouble. Ms Varley, from Aberdeen, said: “The weather is really fierce. I went out to take photos of the ship and it was difficult to stand still to take a photo. The wind kept blowing me forwards. “I didn’t think it was in trouble then but it looked as though it was heavy going, sailing into the wind and the waves. It was sailing slowly. It’s a very heavy sea with big waves. Police said the ship is between the western Norwegian cities of Alesund and Trondheim, about 1.5 miles from shore. A local newspaper reported that two rescue vessels were forced to turn back because waves are 10 to 15 metres high. Ms Varley said: “Hustadvika, where this is all taking place, is a treacherous area of water and there are many shipwrecks there. “They decided to evacuate all 1,300 passengers into helicopters which can carry approximately 15 people at a time. That is a lot of lifts and helicopters trips. Photographer Annie Bradney from Kent said on social media that two family members had been on board but were taken off the ship and sent to hospital. One was stretched off with a knee injury, the other had swallowed some water. By 6pm, over 100 passengers had been taken the two miles to shore. The Red Cross were standing by to help the injured and distressed. Last night Viking confirmed there were 200 UK passengers on board their cruise ship. The firm said a ‘small number’ of people had suffered non-life threatening injuries. Among the passengers on board the 47,800 tonne ship were 450 crew members. A spokeswoman for Viking said an ‘operational task force’ had been sent to Molde where passengers were being taken, and the cruise line owner was expected to attend. She said: “Our first priority was for the safety and wellbeing of our passengers and our crew, and in close cooperation with the Norwegian Coast Guard, the captain decided to evacuate all guests from the vessel by helicopter. “The ship is proceeding on its own power and a tugboat is on site. The evacuation is proceeding with all necessary caution. Twitter was full of messages hoping for news of passengers, and there was strong criticism of Viking Ocean Cruises for arranging a trip around the dangerous coastline at this time of year, and for failing to keep in touch on social media. The Viking Sky has a capacity of 1,300 people – 930 passengers and 370 crew. It visited Scotland in August last year, sailing up the River Clyde to Greenock from where passengers were bussed to Edinburgh. The vessel was delivered in 2017 to operator Viking Ocean Cruises. The company is owned by Norwegian billionaire businessman Torstein Hagen. Viking Ocean Cruises did not respond to a request for comment, and there was criticism on social media from families worried about relatives. The cruise is set to return to London, Tilbury, on March 26. The 12-night journey, which cost just over £4,500, is a one-way from Bergen to London, and themed as the “Northern Lights”. Viking have launched an information line for anyone concerned about friends / family on board. If you have questions or concerns call 07585 779 853 or 0208 780 7900 for UK booked guests or 1-888-889-8837 for those from the US or Australia.